1Naval Medical University, Changzheng Hospital, Department of Orthopaedic Oncology, Shanghai, China DOI : 10.5137/1019-5149.JTN.22580-18.1 AIM: To investigate the clinical characteristics and prognostic factors that may influence outcomes of patients undergoing benignappearing intraspinal malignant peripheral nerve sheath tumors (MPNSTs). MATERIAL and METHODS: This study included a total of 14 consecutive patients who were diagnosed with benign intraspinal tumors firstly and confirmed as intraspinal MPNSTs by pathology. The univariate analyses of various clinical factors were performed to identify variables that could predict prognosis. Endpoints were mortality and local recurrence. The survival rate was estimated using the Kaplan?Meier method, and differences were analyzed by carrying out the log-rank test. In addition, factors with p values of ?0.05 were considered statistically significant. RESULTS: Benign-appearing intraspinal MPNSTs showed some different clinical features compared with spinal MPNSTs and intraspinal benign tumors. 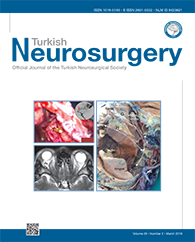 The present study found that age at diagnosis, Neurofibromatosis type 1 (NF-1) history, tumor sites, malignant grade, Ki-67 and tumor resection method might be factors closely associated with recurrence and survival of intraspinal MPNSTs patients.